Plant anatomy is a basic science through which we acquire detailed knowledge of plant organs and tissues which helps us, in turn, to understand the arrangement of the different elements and compounds in the cells. 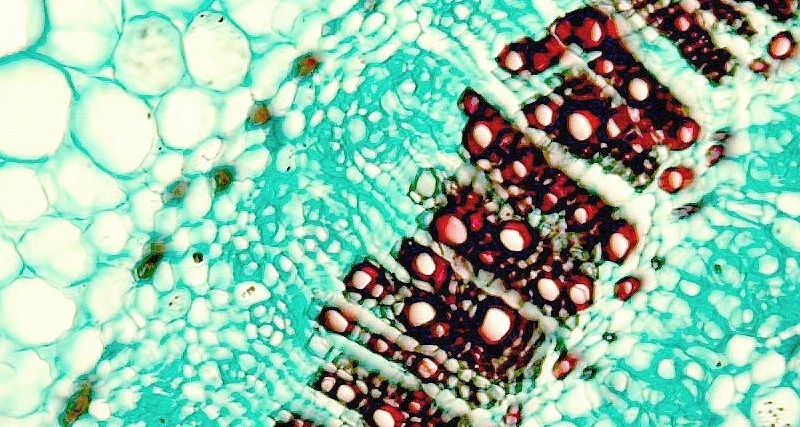 Studying plant anatomy also sheds light on the specific adaptation mechanisms, physiological processes, structural changes, ontogenic processes, as well as helping us establish certain relationships between species, genera and families correctly. Quoting the distinguished Professor of London’s Kew Gardens, Cutler: « plant anatomy is a working tool by which to solve unnerving problems, many of which are of economic importance and very many of scientific interest ». Anatomical-histological adaptations to the environment. Histological detection of the active ingredients in plants of pharmacological interest. Study of histological dysfunction caused by pollutants, with a view to early prevention of damage, special collaboration with Dra. Sanz and Dra. Calatayud of the CEAM group to study how ozone affects different plant species of ecological interest from a cytohistological viewpoint. Cytohistological study of the changes caused by plant pathogens, especially fungi. This study is being carried out in collaboration with the ETSI research group working on phytopathology at the UPV, Dr. J. García and Dra. P. Abas, with whom we share a research project. Cytological and anatomical study of lichens, both photobionts and microbionts, their interrelationship and structural changes that are due to symbiotic processes. In this case the study falls within an interdisciplinary research project in collaboration with the group directed by Dra. Barreno of the University of Valencia, and Dr. Guera Antolín’s research group from the University of Alcalà. Histological study of seeds and relationships with seed viability. Different examples of leaves, stems and flowers of Mediterranean species affected by tropospheric ozone.